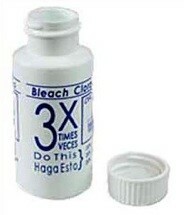 1 oz White Plastic Bottle filled with 1 oz Bleach and capped with bleach resistant cap and cone liner. Screw Top. Bottles are printed with proper sanitizing method.